Home Other Articles Barber: What Is a Barber? A barber (from the Latin barba, "beard") is someone, most often male, whose occupation is to cut any type of hair, and to shave or trim the beards of men. The place of work of a barber is generally called a barbershop, or simply the "barber's." 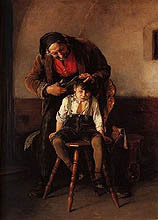 In previous times, barbers also performed surgery and dentistry. Today, with the development of safety razors and the decreasing prevalence of beards, in American and Commonwealth culture most barbers specialize in cutting men's hair. Many barbers may still deal with facial hair if requested.